VOLCANIC ERUPTION COMING FOR ARIZONA? DID YETI KILL NINE RUSSIANS IN 1959? Elaine writes: This link was sent to me by a friend. Will you please ask Gaia if she can help these Tibetans by changing Earth conditions that prevent the Chinese from destroying this “City in the Sky?” Many thanks for your readers to say prayers for them. Gaia, what is the highest probability for the future of Larung Gar, Tibet? Yes, there they face an unfortunate set of circumstances for the near future. The Chinese look upon the Buddhist teachings, even though they are nonviolent, as some sort of threat. Therefore, in the near future they will continue their actions of tearing down the houses built there. Naturally, you can have your readers say a Benevolent Prayer and it will make a difference I can assure you. There will be actions of other countries that will put pressure on the Chinese to leave these peace-loving people alone. They will hear this loudly. Yes, as you were thinking, organizations such as Avaaz can bring this to the attention of the right people. If everything is left as is, then the people of Larung Gar will continue to suffer. Encourage everyone to say a Benevolent Prayer. You would be amazed at how many people will say this BP. There is great power, as I have said before, if ALL of your readers—not just a portion of them—join in. It will also help their own vibrational level by showing compassion and truly feeling it. Keep in mind that this Benevolent Prayer (BP) must be said out loud! It becomes very powerful the more people that say this same prayer. Say, “I ask any and all beings to come to the aid and comfort of all the residents of Larung Gar, Tibet, to keep them safe and to allow them to worship peacefully in their own way, thank you!” Please share with all your friends, no matter their religion. Here is a link to a video of what is happening to the people of Larung Gar. Click here. Now, something else interesting that took place after I finished my session and returned to bed, as I had arisen at 4:45 am. But first a little background. Theo, are there more people or beings that monitor our communications than my guides, and say, Antura? Quite so, Tom. We knew you would ask that question eventually. You have a wide audience of interested beings and, yes, people that tune into our communications, and those you have with Gaia, and whomever else you wish to speak with during these sessions. They only do this with love, Tom, I can assure you as you are one of many measuring points on how well all the people on Earth are adjusting to these new energies, so, naturally, they monitored you before the switch to 5.0 for comparison. Again, they do not intrude unless it is for a specific purpose, such as your soul cluster mate Antura. How many people does that include, Theo? Dozens, Tom, as there are very advanced spiritual people on Earth who have devoted their whole lives to meditation and spiritual endeavors. Does that include the Rosicrucians, or do they only monitor when I mention them? They just perked up, Tom, but they generally only monitor when there are questions about them, such as now. So, don’t be concerned, Tom. They are cheering you on, you understand, as you are asking questions posed by a segment of the population seeking answers, and you are the only person doing this, certainly, in the western world. After my session asking about Larung Gar, as I previously said I returned to bed. Just as I was getting ready to sleep I had a thought about the Dalai Lama and it seemed as if I was imagining meeting him and calling him “Excellency” as I recalled that was how he was addressed, but assumed I was just imagining meeting him. But I decided to ask Theo in the next session. Theo, did I momentarily connect with the Dalai Lama or was that me just imagining that I did? No, you were still in a receptive state, we will term it, as you went to bed and he expressed his thanks for inquiring about Larung Gar and your work. Hopefully our little band of people will grow in saying the BP for this city. Yes, it will, as you will shortly see, Tom. I do encourage you to copy the top part of this and share with your friends to ask them to say the Benevolent Prayer—even better if you know someone in the Buddhist religion. Cyd sent me this question about the enormous ice sheet that is showing cracks at the outflow of the Petermann Glacier in Northwest Greenland. Click here. 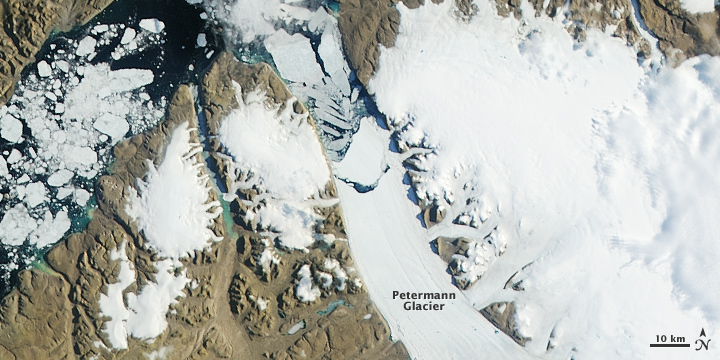 Gaia, what is the highest probability of the Petermann Glacier calving an enormous section this year? It will take a little longer than one year for this to happen, but let’s say the highest probability for this to occur will be within the next 18 months. The eruption of the Katla volcano will contribute to the melting as more warm water will flow into the ocean, but this is a huge floating sheet of ice and it will take a little longer to fully detach itself. I did think it would occur this year in order to assist you in raising the ocean levels 12.5 inches? No, there are many other factors even more important, such as the raising of the temperatures around the world. You could say it will be a byproduct of the rising ocean levels. Theo, what is the highest probability for the future of both radio and TV broadcasting? The way they will be delivered will be the biggest change in the upcoming years. People still enjoy to have the news, but there will be many more times when you will simply choose off a list of stories as you already can now and skip those you have no interest in. Radio will be more narrowcast with the same announcers for multiple types of programming. VOLCANIC ERUPTION COMING IN ARIZONA? Judy writes: The San Francisco peaks were once an active volcano in Flagstaff, Arizona. Will it be an active one again? Gaia, will there be any future volcanic activity in Arizona, including Flagstaff? No, Tom, the closest activity for them will be Yellowstone. The San Francisco Peaks in Flagstaff will remain dormant. That was a good question from your reader. Speaking of Yellowstone, am I correct in saying that the eruption will be more than five years away but less than ten? There you have it, Tom. I do not wish to be more specific than that at this time. So, from our perspective it will be in the time period of 2023 and 2028, correct? May I ask why you do not wish to narrow it down anymore? Yes. It is because there are numerous people who need to be involved in that event that are not in place yet. There are those that will heed my warning not only about the volcano but also about the mini ice age and then there are others who will move to a location that will experience these events. Large events like this take coordination and timing. Antura is a member of my soul group or “cluster” as it’s called. There are eight in my cluster—fragments of our soul. Some clusters have six to twelve soul fragments. As we all come from other planets to take part in the “Earth Experiment” to fast-track the raising of our soul vibrational levels, after 800 lives on Earth, Antura is back for a life on Nommo, the water planet located in the Sirius B Solar System before returning for another life on Earth, where most of his lives have been as an explorer. Did I mention he’s an amphibian? Read more about him in my book FIRST CONTACT: Conversations with an ET. He’s coming to Earth on one of those huge three-mile-wide and twenty stories tall motherships around October. I’m told that if everyone doesn’t freak out when the Pleiadians land in Russia around December 1, I’ll get to meet him in 2018. I hope that probability holds. Here are more questions this week. Carol writes: Many years ago, I had an experience where I woke up with my legs in stirrups, blood running through tubes, a bright light in my face, but fell back to sleep. Who were they? I didn't feel fear, only tired. About 10 years later, I experienced becoming aware of a being (green humanoid), my hands were around his throat, again I wasn't afraid, more like a feeling of "what the F__K are you????!!! He acted busted, like I caught him in something. Was he my offspring? I was involved with a spiritual practice and one technique was disengaging from a being attached to us on our left side (Wesedak). I did the practice, but might have disconnected too early and woke up SIX times with bloody slashes on the inside of my left thigh. How can this be? Would a being come into our dimension, with claws, to slash me? Or did I go into his dimension with my physical body?? It has always bothered me even though it's been ten years; I am in a dark night of the soul and would like to come out of it. Lastly, (sorry for so many questions), I say Benevolent Prayers for immigrants and refugees to find a new stable, comfortable home. I also ask for one for myself since after this year I have no prospects to be able to survive in a home (not enough money). Is that prayer for immigrants and refugees just too huge? There are so many suffering on the planet. I can't lose the horror of it. It's so negative, how can I do any good when I'm in a negative, horrified state (and for the animals, too)? BTW, how can I lose a visual that is much too much to bear? How can I get over it and move on and do some good? First, just keep requesting MBOs for you and saying BPs for others. You are making a difference, just have faith. Keep sending white light all over the Earth as I do each time I meditate. This acts as a prayer for the planet and Gaia has said she likes these and BPs of all types. Don’t forget you can request an MBO to sever any energy cords not in your best interests and you can surround yourself with white light. Antura, was Carol abducted and why the slashes on her inner thighs? Yes, she was, Tom. The slashes came from resisting the Zetas and causing their instruments to injure her. She was a real problem for them. Again, she needs to undergo hypnosis to understand better, but it needs to be someone who can keep her calm and above what was happening to her as otherwise it will cause her distress. The Zetas also will be able to bring those memories back without the emotion. Laurie writes: I’d like to ask about the negativity produced during the Star Wars. 2) Are there interplanetary or interstellar star wars or conflicts still happening in our universe producing negativity? 3) Do the unveiled beings in our universe remember the Star Wars? How do they feel/cope with those memories & emotions? Antura, what happened to all the negative energy produced by the Star Wars? And did we have to process some or quite a bit of it? In a way, you have processed some of that energy since there are soul memories that manifest in such things as movies and TV shows. But again, we must return to the explanation that the negative energies were never really absorbed. The other societies, as you have been reminded many times, could not work with negative energy, so it was sent off into space. That’s the best that we can describe at this time in your development. There is no interplanetary conflict anywhere in the universe currently? Small conflicts, but there are now teams of mediators that go to these planets to mediate a settlement of their differences. Will we ever assist as mediators? That would be really far in the future, Tom, as first you need to experience the many differences between societies on the planets you will visit after you achieve the ability to portal hop across the universe. And yes, there will be those who will be honored who are the first to travel from one end of the universe to the other, and also those who are first to travel to the next universe over. You are the Explorer Race. Do the citizens of these planets in the Federation have memories of the war, or only past life memories? They would be past life memories as this was long ago even in universal years. How were the souls of the planets that were destroyed resettled? Excellent question. The souls inhabiting higher focuses assisted and we assisted those souls in choosing new planets that were similar, but had not yet been colonized we will call it. It would be like when we colonized on Nommo. We asked the soul of the planet if it would be all right to settle there, and the soul of our planet was pleased to accept us. That would be similar to what occurred for all the souls of the people whose planets were destroyed, including all those on both sides of the conflict. And yes, as you were thinking, there were some adjustments allowed by those planetary souls in order for the souls to have a planet fairly close to the ones that were destroyed. Again, I am describing this in 3D or 5D terms when these decisions were instantly made on a soul level. Sara writes: I was wondering if our ET family had anything to do with N. Korea's failed missile attempt? I remember reading in one of your newsletters or books that we had passed the mark of ever annihilating ourselves again. And that there were protections in place or something, so that we wouldn't be able to blow ourselves or each other up. So, did they help in keeping it from happening? And if so, how was it accomplished? An EMF signal, or what? Thank you for asking for us! Antura, did anyone in the Federation mess with the North Korean missile test? No, although that is not to say that it was a failure on its own. You could say there was a little assistance by human hands. Jen writes: With all the studying that everyone is doing to see how we learned to live with the negativity, have they made any new conclusions about how we did that? What did we do differently this time? Antura, have ETs made any conclusions as to how we have balanced negativity this time when in the past we failed? That’s why we are taking millions of readings each day between all the ships from the Federation and beyond. The conditions seem the same, but this time you passed that invisible marker that meant you will never destroy yourselves in the future again. Again, we must applaud you for staying the course. It helped that so many more seasoned souls decided to incarnate to work and assist getting past that August 1987 date when your vibrational levels rose. Now, the negative energy will slowly decrease over the coming years, just as was explained to you in the past. Life will truly get easier, although as you have also been told, there are some large events coming. I haven’t asked this before, but after you Sirians make yourself known, will the Arcturians do the same? Probably not. They were one of the factions that were concerned about our appearances (along with the Pleiadians and Zetas) being too much too soon. They will sit back and see how things progress. They have not ruled it out for the future, but are in no rush to follow our lead. Cheryl writes: I always say MBOs before I drive anywhere…for a safe drive, quick arrival, little traffic, close parking spaces, short lines, for the car to run well, etc. For the last year or so I’ve asked for my tires to be all right on the road because they are old and need replacing, and I still haven’t done that. Last week I had orders to pick up at Walmart (new printer, birthday gifts, and groceries) and started saying all my MBOs while I was getting ready to leave. I went outside to find a flat tire! It wasn’t flat two days earlier. It was the driver’s side (easily visible). I caught a ride with my daughter-in-law to pick up everything and my son put the spare on that night. He said it went flat from dry rot (old age), so I shouldn’t drive far until we get them replaced. I had driven 40 miles round trip to a doctor’s appointment two weeks before. The point is, I said MBOs for safe trips and for my tires to be all right ON THE ROAD…my tire went flat IN MY CARPORT. I would say that MBOs work very well. Thank you, Tom. Rose writes: I've requested MBOs for the right home. Even been given a picture, but no place where it is. One day I was almost home, I live rural, and discovered my gas tank light was on and I'd driven almost 450 miles on my 15-gallon tank. It is 12 miles to the closest gas station. I had no gas, requested an MBO to get me there. Not only did I make it but had over two gallons left in the tank. I know MBOs work! Many of my friends now say them with perfect results. Thank you for being who you are. So, I decided to ask you and your people on Facebook to help me with a BP, namely my daughter to find the best job for her! I received the answers "done" and the good news came about two months afterwards. The difference when more people ask is that I was very calm und sure in this period, I had the great feeling that I was not alone. This is a real feeling. Kathy writes: First, thank you. Love the newsletters and thank you for helping us with BPs. I saw a documentary on Yetis in Russia in 1959. Did a Yeti kill the group of people camped in the mountains of Russia that were studying them? This was very interesting. Click here. Gaia, did a Yeti kill a group of people in Russia in 1959? Quite so, Tom. You thought that was just a story, but the Yeti felt threatened and felt it was saving its family. Leanne writes: What is the spiritual reason behind PTSD, or in this case, why did my husband suddenly develop it? He is quite ok these days and plays golf three times a week; I was just curious from a spiritual point of view. Theo, is there a past life reason for PTSD, or is it just a bucket list experience? In a way, it is a bucket list item, Tom, but it is a condition that many warriors have experienced through the ages—it just did not have a name. Humans are humans and when they commit atrocious acts in the name of a war, those memories stay with them the rest of their lives. And even if they themselves did not commit the acts, to see the results of man’s capabilities to inflict harm on defenseless people, it makes them question their part in the whole idea of waging war. And to answer your question, yes it can be a buildup and remembrance of a life before the present one. Just as you decided before this life to experience congestive heart failure as a reminder and balancing of the life when you were a warrior and brought heartache and grief to the families and friends of those you killed as a soldier, there is balancing for everyone in their present lives and/or future lives. They may decide to balance in this life by taking their own lives, or subject themselves to PTSD. There are thousands of options, shall we call them, for balancing. They can volunteer to assist those who are less fortunate and that will assist in balancing. What can they do to show love? That is a question they can only answer for themselves. Fortune writes: I have a few questions you could help me with. 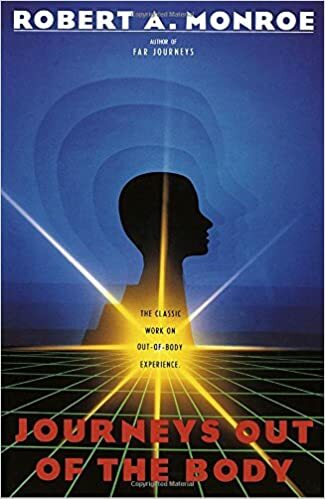 In Robert Monroe's astral journeys, he talks of having gone through a cut-out hole in a wall to another physical world where he is attracted to a particular person to the point of taking over his body. 1. How did it happen that there was a cut out hole through this wall? 2. Had this specially been done for him since he got invited through? to the other when he took over his body? 4. What effect did this have on both of them? 5. What level was this other world? selves more often and we may not be aware of it? 1. He experienced a cut out in a wall that led him to another reality? That was the way it appeared at that moment. 2. Was that done especially for him? 3. Did he actually go to Time Line 5 in this case? Correct. He was able to briefly combine with his Time Line 5 self. He did not combine with his Time Line 7 self that you were thinking to ask. I will add that this was to demonstrate to those who read the book that there are parallel time lines—or at least more than just your current reality. 4. What happened to both? He retreated back to his own existence. Remember you are at a slightly higher frequency, so you would not want to stay, as it will feel just a tad denser to you. It was the same for his Time Line 7 self. 5. Does this ever happen to us? As you were told in the past, you have combined several years ago with your Time Line 5 selves, and recently for a short period of time with your Time Line 7 selves. These were designed events for different reasons explained to you in the past. Everybody seems to be going bananas for Stephen King's It (his horror novel first published in 1986). This is because the movie of the novel will be released in September this year. The trailer for the movie received 197 million views globally within 24 hours, and 246 million views in 36 hours. 1. What was King's soul contract regarding writing the novel “It”? 2. Will the film released in September be well received? Click here. Tom, I'm sure you've read Blood Meridian. It's considered to be one of the greatest American novels ever written. 1. Cormac McCarthy must have had some very heavy past lives to write the book. Did he have many ultra-violent lives in the American West to write the novel? 2. The novel is considered to be unfilmable due to the graphic violence. Will the book ever be turned into a film one day? Click here. "The final product will not be the same, but there will be similarities. I will leave that to someone in the future who will make the connection". So, is the Flyboard Air (invented by Zapata Racing) the Hoverboard that Theo was talking about? It boasts flights up to 10,000 feet, and has a top speed of 93mph. It is, however, still in prototype phase. Here is the YouTube video of it in action: Click here. Theo, why did Stephen King write IT? Yes, Mr. King has a vivid imagination, steeped in the horror field, so his guides gave him a doozy shall we say. It is all part of his soul contract to explore extremes and what ifs. Was there any nefarious reason? No, just the exploration of the macabre. I assume the movie will be successful? Yes, it will be a blockbuster to use that terminology. Theo, did Cormac McCarthy have several lives in the Old West or did he perhaps combine other violent lives for his novel? The first guess was correct by your reader. He had several lives as both a bad man—and woman we will add—and the good, kind soul caught up in capturing bandits, thugs and killers. These lives prepared him to be able to write a no-holds-barred look at the Old West as there were people that as part of their soul contracts played both victims and the perpetrators. The Old West, you could say, was white washed by history. Is the Flyboard Air the initial version of a future Hoverboard, or is there still something else to be invented in the future? Still something else that will be much safer that will be used over land and water. The Flyboard is for the real thrill seekers and requires too much energy to operate, and as you saw in the video, speeds that fast can be quite dangerous.